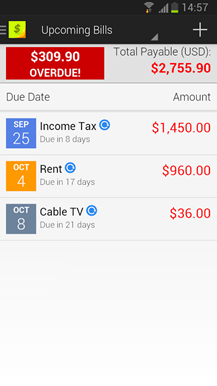 Simply key in your payment amount and due date and this bill tracker app will notify you in advance when your bill payment is coming due. 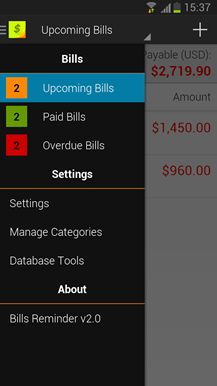 With this handy mobile payment tracker with you at all times, now you don’t have to worry about forgetting to pay your bills while you go about your busy schedule! 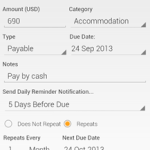 -Enter your bill payment amount and the due date via an intuitive user interface. -Bill Reminders will fire off reminder notifications every day at a preset time (default is 8:00am) until you have paid your bill. Your device LED will also flash a distinct orange color to indicate that a bill payment is coming due. 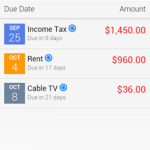 -Unlike other bill tracking apps, Bills Reminders will always fire off when the bill payment is coming due, no matter whether you have opened the app or not or whether you have rebooted your device. 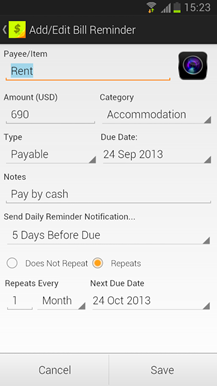 -You can also capture or attach photos of bills, invoices, receipts alongside each bill reminder you created. This is helpful when it comes to actually making the payment. 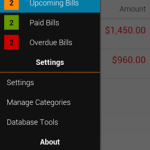 All the information is already stored in the app, so there is no need to go and find that paper bill statement. This app is brought to you by Handy Apps!